DUBAI, March 21 (Reuters) - One of the Arab world's most unusual and far-flung business empires was born among the booming economies of the oil-rich Gulf. Now it is counting on the Internet to fuel expansion around the globe. Talal Abu-Ghazaleh, the 75-year-old former Palestinian refugee who founded the Talal Abu-Ghazaleh Organisation (TAG-Org) 4 0 years ago and still chairs it, says it has outgrown his original conception as an Arab multinational. "I was thinking that as an Arab, I wanted to create something of which Arabs could be proud - the kind of international business which hadn't existed before," Abu-Ghazaleh said. "As of today we're an international organisation, not an Arab organisation." Established as an accounting firm in Kuwait in 1972, TAG-Org has become a complex web of companies providing business services across the region and further afield. It operates in every Arab country and has over 70 offices worldwide, in countries including Afghanistan, China and the United States. Businesses range from management advisory services, intellectual property protection and legal assistance to educational consulting, information technology solutions and real estate management. It is a rare example of a Middle East-based group which prospered by taking on Western multinationals in knowledge- and management-intensive businesses that they have traditionally dominated. "When Talal Abu-Ghazaleh embarked on his private venture in Kuwait, there were only a few Arab accounting firms and it was mostly the big foreign names that dominated the Gulf," said Mifleh Aqel, a prominent consultant and former banker in Jordan. "He managed to succeed against the odds and tough competition from the foreign accountancy firms that had the lion's share of the business in the Gulf." Abu-Ghazaleh says he now plans to expand TAG-Org's business into sub-Saharan Africa, South America and Eastern Europe, offering web-based services to seek customers in areas where the group does not yet have a strong physical presence. Born into a land-owning family in Jaffa, Abu-Ghazaleh fled advancing Israeli forces with his parents and moved to a village in southern Lebanon. He obtained a degree in business administration at the American University of Beirut on a United Nations scholarship. He says he studied under street lights in Beirut because his living quarters did not have electricity, and worked as an English-Arabic translator and an accountant in a vegetable market before getting a private sector job in 1960 in Kuwait. He remained there until Saddam Hussein's invasion of Kuwait in 1990, which prompted him to move with TAG-Org's headquarters to the Jordanian capital, Amman. He has dual Jordanian and Canadian nationality. Abu-Ghazaleh attributes part of his success to TAG-Org's unusual structure. Unlike many big accounting and law firms in the West, it is not a traditional partnership, he says; it is owned by a form of trust and partners share in the profits but not the equity. This makes it easier to replace top managers when necessary and to plan flexibly. It has also helped TAG-Org expand in Arab and other countries where there are ownership limits for foreign investors; since TAG-Org does not have a traditional shareholding structure, it has been able to cope with such rules relatively easily, Abu-Ghazaleh said. In the dominance of its founder and the participation of his family members - Abu-Ghazaleh's two sons and two daughters are all involved with TAG-Org - the group resembles a traditional Arab family business. In other ways, it has a rigorous business culture that is rare in much of the region. Employees, more than 3,000 in total, must wear dark suits and ties - blazers and trousers are not allowed - and shirts must be white, light grey or light blue. 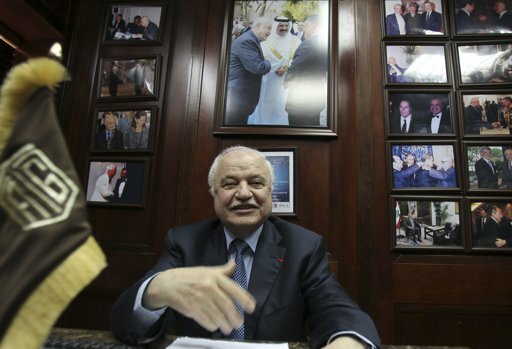 Abu-Ghazaleh enforces a corporate style for writing memos. Like many of its competitors, TAG-Org does not disclose revenues or profits, so judging its financial strengths and weaknesses is difficult. Abu-Ghazaleh says revenues have grown by at least 10 percent annually in recent years and that he aims for 20-25 percent growth this year. "The global crisis has helped us in some areas," he said. "It has increased companies' demand for some of our services." Abu-Ghazaleh, who says he has no plans to reduce his role in management with age, predicts the "Arab Spring" uprisings that rocked the Middle East last year will benefit economies by removing entrenched official interests that blocked competition. Before the Arab Spring, for example, TAG-Org could not offer an information technology training course in Egypt because "vested interests in the government" gave an effective monopoly to a competing programme from which they profited, he said. It could not offer the service in Libya because people close to Saif Al-Islam, the son of toppled dictator Muammar Gaddafi, wanted to get involved. Now Abu-Ghazaleh sees opportunities to run the programme in both countries. He also wants to use the Internet to expand TAG-Org's employment of online workers, in areas such as translation and web design. This could create jobs in Arab countries where social or security constraints have made employment difficult. Most online work for TAG-Org in Saudi Arabia is done by women, Abu-Ghazaleh said; they can operate easily from home but it is hard for them to work in male-dominated offices. Women in the Palestinian Territories can also work online. TAG-Org aims this year to launch a global "virtual university" for employees of corporations, using the Internet to teach vocational and business skills, languages and academic subjects. "In 20 years there will be no buildings for universities" as online education replaces them, Abu-Ghazaleh predicts. Such ideas are being pursued by deep-pocketed companies around the world, and TAG-Org's expansion plans are likely to bring it into fiercer competition with Western multinationals defending markets that they dominate. It is unclear if the group's unusual structure will continue to benefit it as a fully global business. But Abu-Ghazaleh rejects suggestions that he was a lucky beneficiary of the 1970s, when he launched his group as the Arab oil boom began and when most of his Western competitors had not yet entered the Gulf. He dismisses the idea that similar conglomerates could not be developed in the region today.